Chris Koza (top) and (L-R) James Detmar, Joy Dolo, Jim Lichtscheidl, Royer Bockus and Joshua James Campbell. Photo by Dan Norman. It is always interesting to observe theatrical forms mutating and evolving. 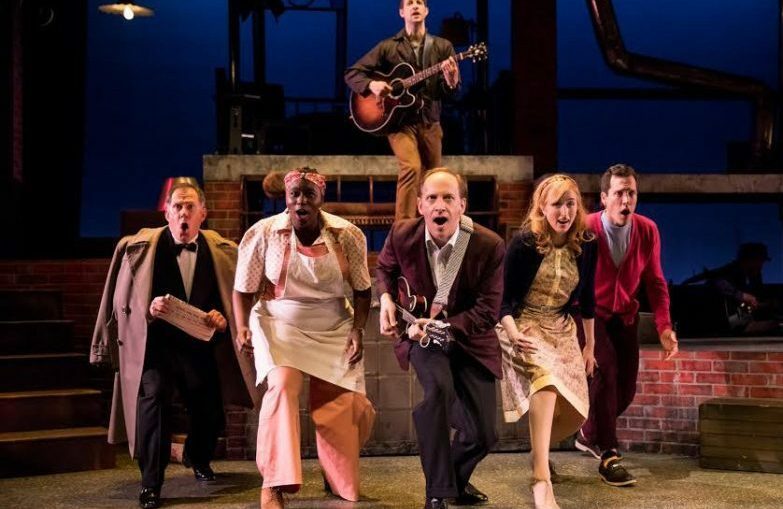 Fly by Night, now playing at the Jungle Theater, is advertised as a rock musical – a term that has grown from something very specific to an umbrella term covering a wide range of musical genres. As someone with rather picky – or, perhaps I should say, “limited” – musical taste, I was a little worried about what I signed up for. However, the music (mostly indy rock inflected with early Beatles) and the lyrics turned out to be pretty and artfll and clever. While only two of the songs and a melodic refrain are especially memorable, the score as a whole was enchanting. The eclecticism of this show is appealing. I especially liked the use of leit motifs for each character that overlap and then unravel. The onstage presence of the four-member band (led by Mark Christine and featuring Dan Schwartz on guitar) is part of the magic, and director Sarah Rasmussen smartly places these players under one of the many nooks in Joseph Stanley’s multi-layered set so they can work closely with the actors. Crabble (Joy Dolo) looks on in Fly by Night. Photo by Dan Norman. Rasmussen was also wise to cast a real guitar-playing and singing musician like Chris Koza as the young protagonist Harold McClam. Koza knows how to tell a story and convey subtext with his voice, which is sweet and unaffected. As a lost and kind of dopey sandwich maker with a sweet smile, he is genuine and endearing. Harold works in a New York deli with Crabble (a great Dickensian name! ), who is played by the radiant Joy Dolo. We first meet Harold just after his mother’s funeral; he feels fine, he tells his father (James Detmar, persuasive as the grieving widow), and is eager to catch his train – but on the way out he spies a guitar among his mother’s old possessions. Within months, Harold is performing a song about sea turtles undergoing a post-nesting existential crisis – one of the musical’s great songs. This is getting ahead of things, which the play, being non-linear, does all the time. That is part of the idea: that what we think of as “a life” is just a set of isolated, especially salient moments that we impose a form upon. What’s the show about? Death, Metaphysics, Innocence, Immortality, Fate, Love, New York – all the usual themes. It also has several improbable coincidences with plot consequences, like the 1965 New York City Blackout occurring exactly one year after the death of Harold’s mother. There is also some quasi-scientific New Age mysticism. Ultimately, it’s not clear how it all fits together (or if it does), but Fly by Night is compelling, fun, and beautifully executed by the actors. One of the play’s more admirable characteristics is how it explores the distinct and various ways people have of coping with loss and of mourning. Harold’s father carries an old portable record player with him wherever he goes so he can play a recording of La Traviata, remember his first date with his late wife, and not feel alone. Miriam’s (and Daphne’s) father is dying; she can’t imagine life without him, but he comforts her with the idea that we are all made up of the constantly recycled dust from exploding stars (this may recall last season’s Constellations) and won’t really be parted. When she feels alone, he counsels, she need only look up to the night sky to find him there. 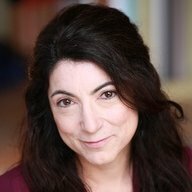 Here are some of the other narrative lines: Daphne (Royer Bockus), the community theatre queen of her small town, persuades Miriam (Leah Anderson) to go to New York City with her and share an apartment. Miriam has been perfectly content with small-town waitressing, while Daphne chases her dream of big-city stardom. Miriam duly finds a waitressing job in Brooklyn, while Daphne…sells their car to pay for audition headshots. Harold tries to make peace with loss through music. Before he can complete the fabulous turtle song, however, he suffers through a long and painful bout of songwriter’s block. His days are taken up by mindless work he shares with Crabble. The deli duet “Mayonnaise, Meat, Cheese and Lettuce” is one of the play’s highlights as Crabble and Harold talk-sing of deadening ennui and vanished promises. Meanwhile, Harold starts dating Daphne, who advises him seize the day and be a “man of action”! Revved up by Daphne’s platitudes, Harold asks her to marry him. (Action!) Of course, the audience soon starts to worry for him: the two are clearly not compatible (he’s deep, she’s perky and surface; he’s a nebbish, she’s a striver). Since they are young and lonely in New York – and both are cute – they get engaged instead. However, Harold then meets Miriam, the “quiet one,” and their motifs instantly blend. Leah Anderson perfectly captures Miriam’s quirkiness and guileless nature. Anderson never “plays” quirky or innocent; she embodies those traits in such a genuine way that it is hard to imagine the actress differing much from the character. It is that honesty, or lack of affectation, that Harold is drawn to; you understand why he feels he needs to be with her. 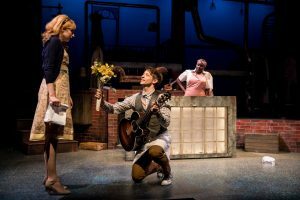 The play has a rom-com skeleton in which the boy eventually gets the (second) girl – a development that’s less surprising when the narrator (a brilliant Jim Lichtscheidl) states in the first scene that the story will be about a love triangle. Matters get complicated and rather heavy, in a way that again recalls La Traviata. Sad and serious musicals have been around for some 40 years or more. Audiences come prepared these days to hear a cello play in minor keys, and no one expects a set of lovers to walk off into the sunset together. This play is so lovely and Rasmussen works the themes of mystery. transformation. and the uncanny to such great effect that one is reluctant to point out flaws, since the show is so good in many ways. The most significant issue, in the end, is a radical tone change in Act II that occurs so abruptly that it feels distractingly gratuitous. The writers, one imagines, must have been going for shock value – but to what end? To seem more original? The play is plenty offbeat already. Kafka said that the meaning of life is that it stops. Those we hold dear leave us; how do we make sense of that? Are there meanings that we can cling to? Things can’t be lost?. When Miriam’s father was alive, the two would go into the garden and trace the constellations. The narrator sings again and again of “Instants” and “Moments.” I think he (and the play) are suggesting that this is all we have: abbreviated dialogue, memories of important afternoons, and nights with fathers or lovers in gardens. Thus, an aria from La Traviata recalls the evening we fell in love and brings to us back to that moment, that face, that person, as if she never left. People string them together and trace them like early stargazers found heroes and animals and stories in the stars overhead. We trace lines between our moments and a shape emerges and that becomes our story. We draw meanings from the constellations of our moments And who we are is always also who we have loved. While the mixture of music, froth, and heaviness in Fly by Night may not work seamlessly, it weaves a magical web of instants and moments and generates the sense of wonder we hope to find at the theatre. Fly by Night plays through July 23 at the Jungle Theater in Minneapolis.